Cosc 5/4730 Blackberry Drawing. Screen size With Blackberry devices, they have a known screen size in pixels. If you are programming for specific device. 2 Screen size With Blackberry devices, they have a known screen size in pixels. If you are programming for specific device then it’s easy. 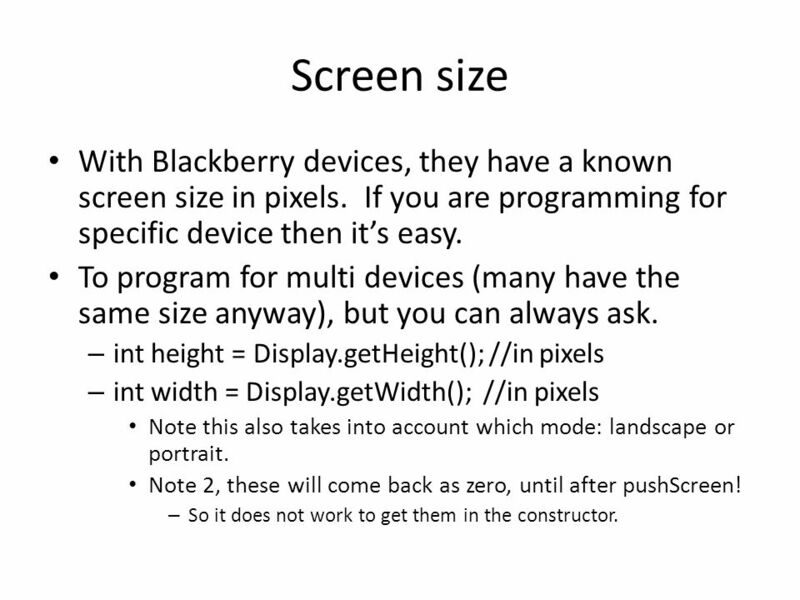 To program for multi devices (many have the same size anyway), but you can always ask. – int height = Display.getHeight(); //in pixels – int width = Display.getWidth(); //in pixels Note this also takes into account which mode: landscape or portrait. Note 2, these will come back as zero, until after pushScreen! – So it does not work to get them in the constructor. 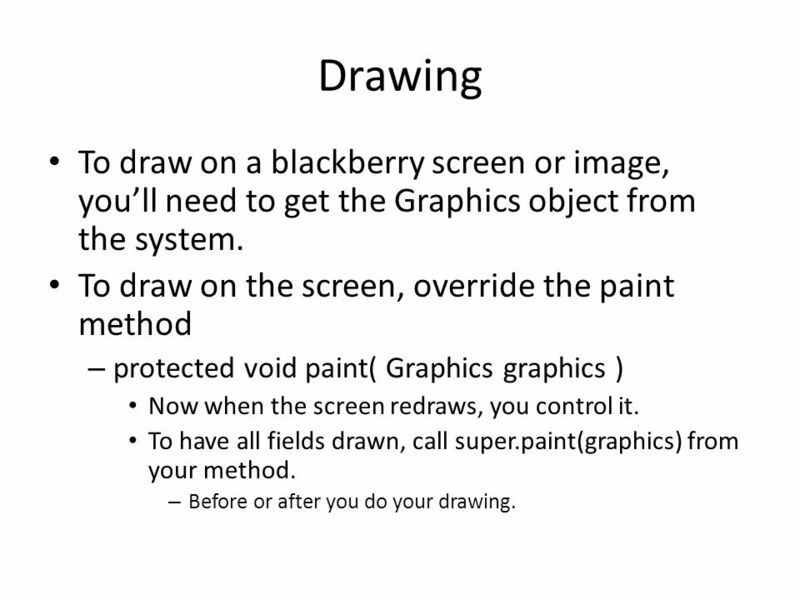 3 Drawing To draw on a blackberry screen or image, you’ll need to get the Graphics object from the system. To draw on the screen, override the paint method – protected void paint( Graphics graphics ) Now when the screen redraws, you control it. To have all fields drawn, call super.paint(graphics) from your method. – Before or after you do your drawing. 4 Drawing (2) You can also draw on things like a bitmap. – Bitmap myImage = new Bitmap(360,480); Full screen image for a storm 1 & 2 in portrait mode. 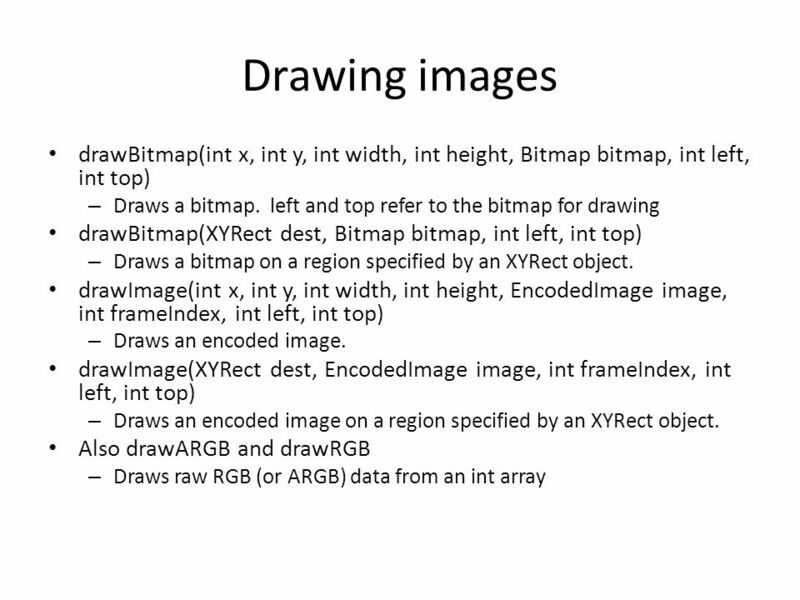 – Graphics myImageG = Graphics.create(myImage); – Using myImageG, we can now draw on the bitmap image. 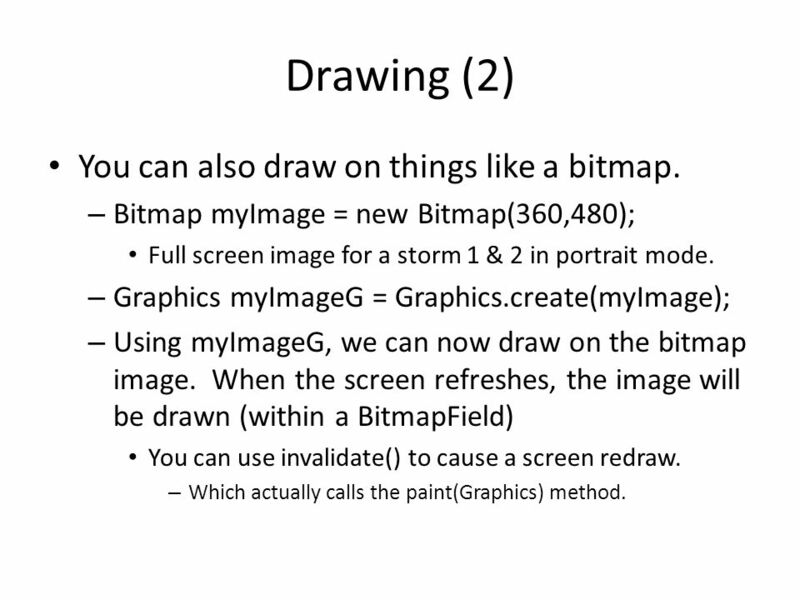 When the screen refreshes, the image will be drawn (within a BitmapField) You can use invalidate() to cause a screen redraw. – Which actually calls the paint(Graphics) method. 5 Graphics The top left of the screen/graphics area is 0,0 and the bottom right is getWidth(), getHeight() clear() – clears the entire graphics area to the current background color setBackgroundColor(int RGB) – Sets the current background color. setColor(int RGB) – Sets the current color to for drawing. 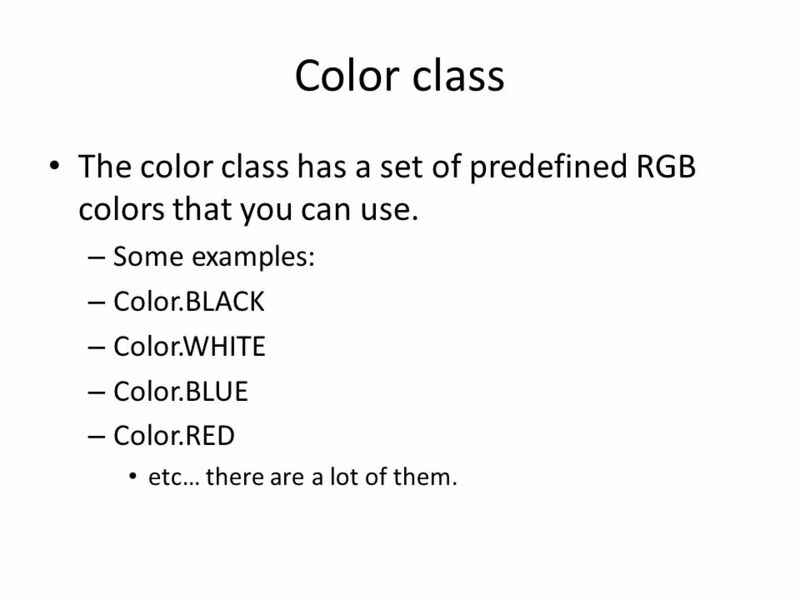 6 Color class The color class has a set of predefined RGB colors that you can use. 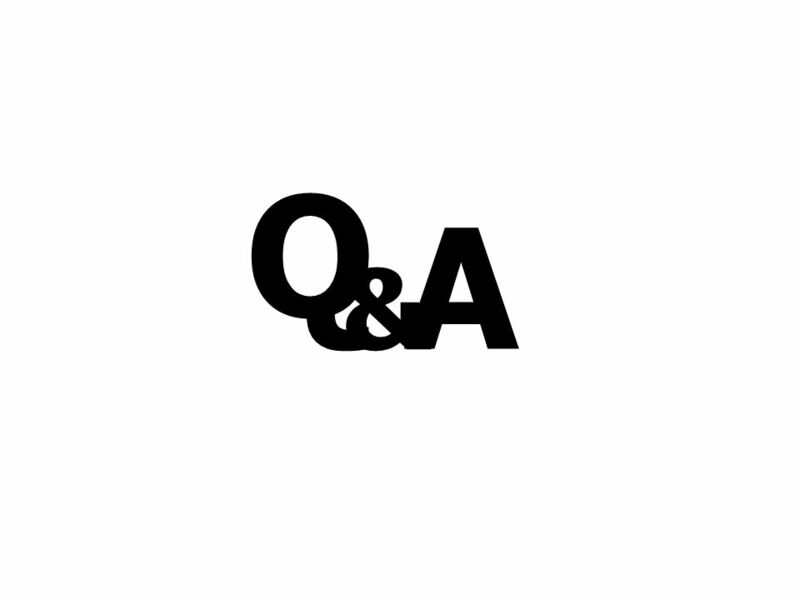 – Some examples: – Color.BLACK – Color.WHITE – Color.BLUE – Color.RED etc… there are a lot of them. 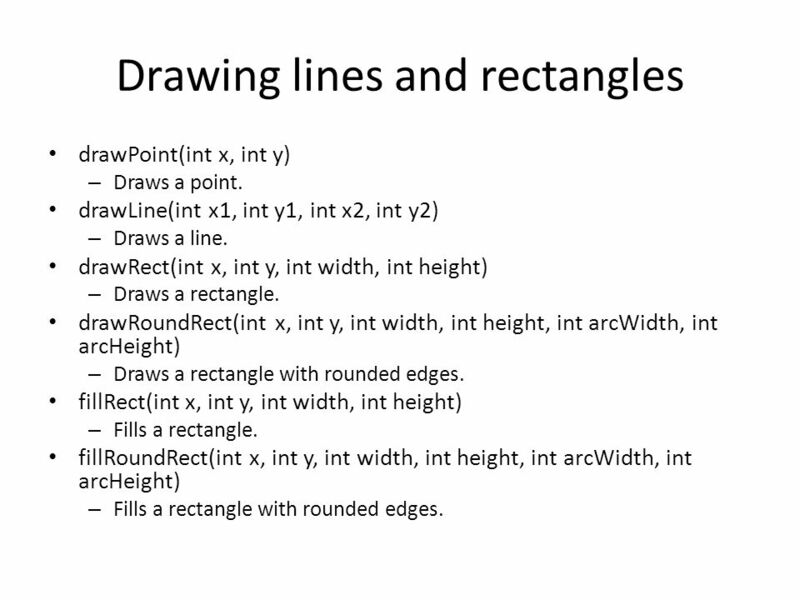 8 Drawing lines and rectangles drawPoint(int x, int y) – Draws a point. 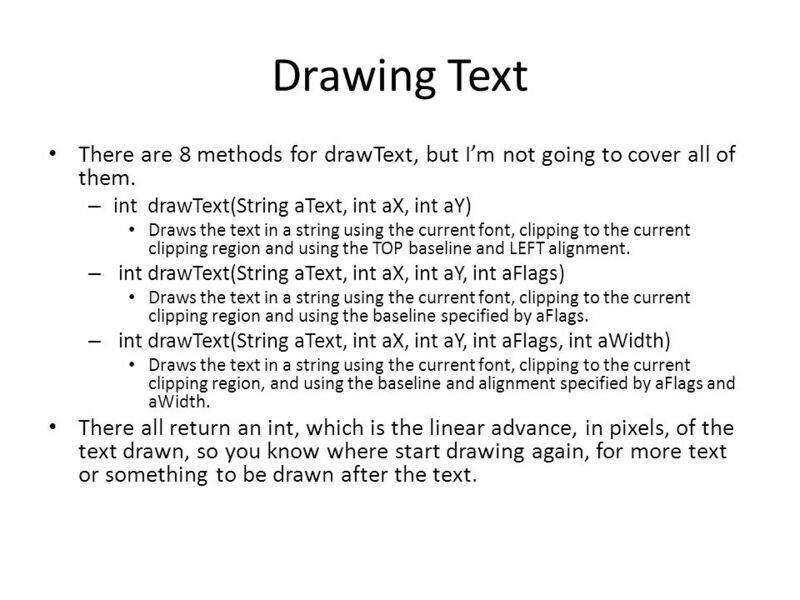 drawLine(int x1, int y1, int x2, int y2) – Draws a line. drawRect(int x, int y, int width, int height) – Draws a rectangle. drawRoundRect(int x, int y, int width, int height, int arcWidth, int arcHeight) – Draws a rectangle with rounded edges. fillRect(int x, int y, int width, int height) – Fills a rectangle. fillRoundRect(int x, int y, int width, int height, int arcWidth, int arcHeight) – Fills a rectangle with rounded edges. 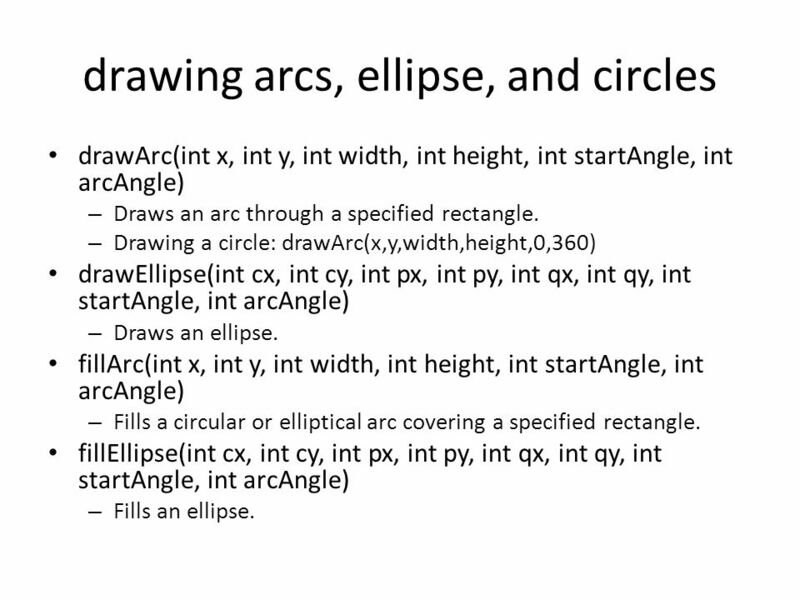 9 drawing arcs, ellipse, and circles drawArc(int x, int y, int width, int height, int startAngle, int arcAngle) – Draws an arc through a specified rectangle. – Drawing a circle: drawArc(x,y,width,height,0,360) drawEllipse(int cx, int cy, int px, int py, int qx, int qy, int startAngle, int arcAngle) – Draws an ellipse. fillArc(int x, int y, int width, int height, int startAngle, int arcAngle) – Fills a circular or elliptical arc covering a specified rectangle. fillEllipse(int cx, int cy, int px, int py, int qx, int qy, int startAngle, int arcAngle) – Fills an ellipse. 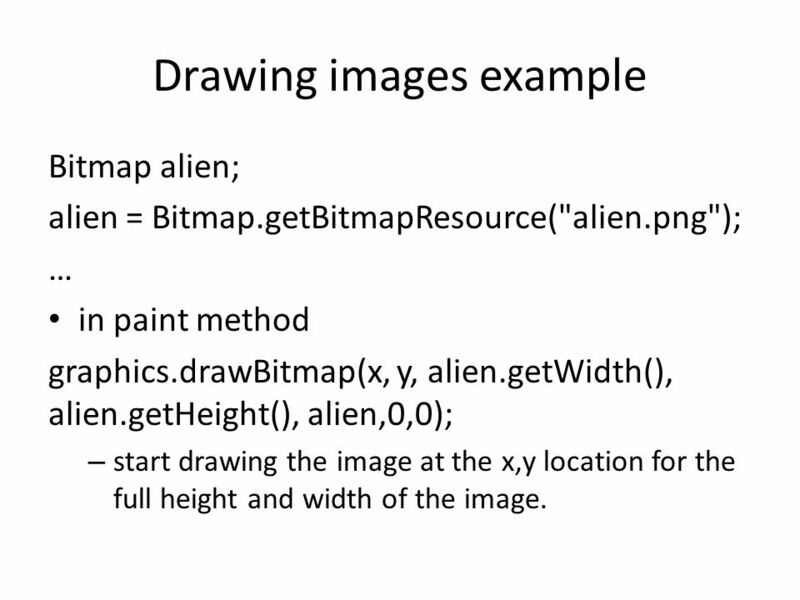 11 Drawing images example Bitmap alien; alien = Bitmap.getBitmapResource("alien.png"); … in paint method graphics.drawBitmap(x, y, alien.getWidth(), alien.getHeight(), alien,0,0); – start drawing the image at the x,y location for the full height and width of the image. 12 Drawing Text There are 8 methods for drawText, but I’m not going to cover all of them. – int drawText(String aText, int aX, int aY) Draws the text in a string using the current font, clipping to the current clipping region and using the TOP baseline and LEFT alignment. – int drawText(String aText, int aX, int aY, int aFlags) Draws the text in a string using the current font, clipping to the current clipping region and using the baseline specified by aFlags. – int drawText(String aText, int aX, int aY, int aFlags, int aWidth) Draws the text in a string using the current font, clipping to the current clipping region, and using the baseline and alignment specified by aFlags and aWidth. There all return an int, which is the linear advance, in pixels, of the text drawn, so you know where start drawing again, for more text or something to be drawn after the text. 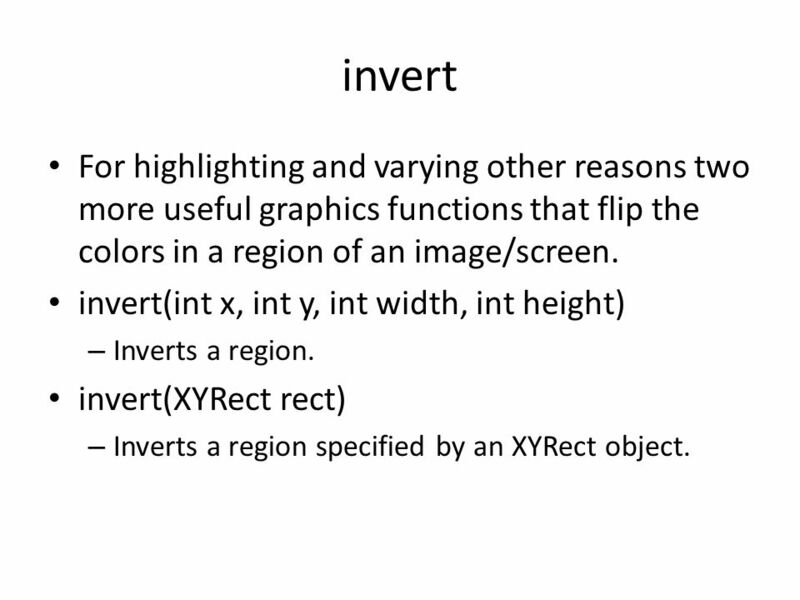 13 invert For highlighting and varying other reasons two more useful graphics functions that flip the colors in a region of an image/screen. invert(int x, int y, int width, int height) – Inverts a region. invert(XYRect rect) – Inverts a region specified by an XYRect object. 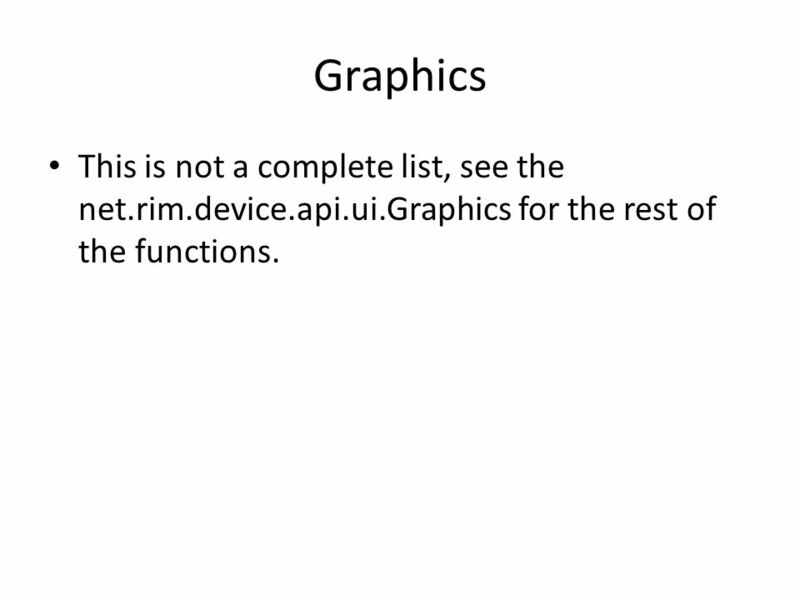 14 Graphics This is not a complete list, see the net.rim.device.api.ui.Graphics for the rest of the functions. 15 double buffering. 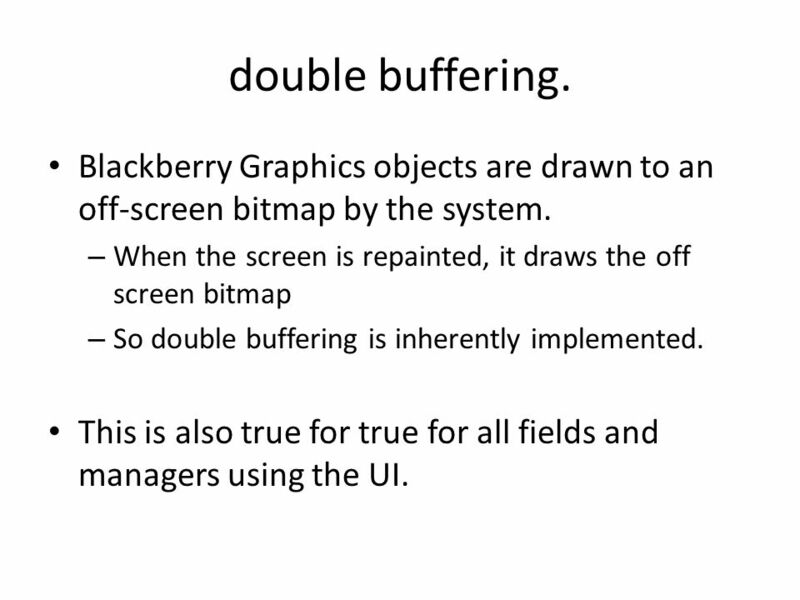 Blackberry Graphics objects are drawn to an off-screen bitmap by the system. 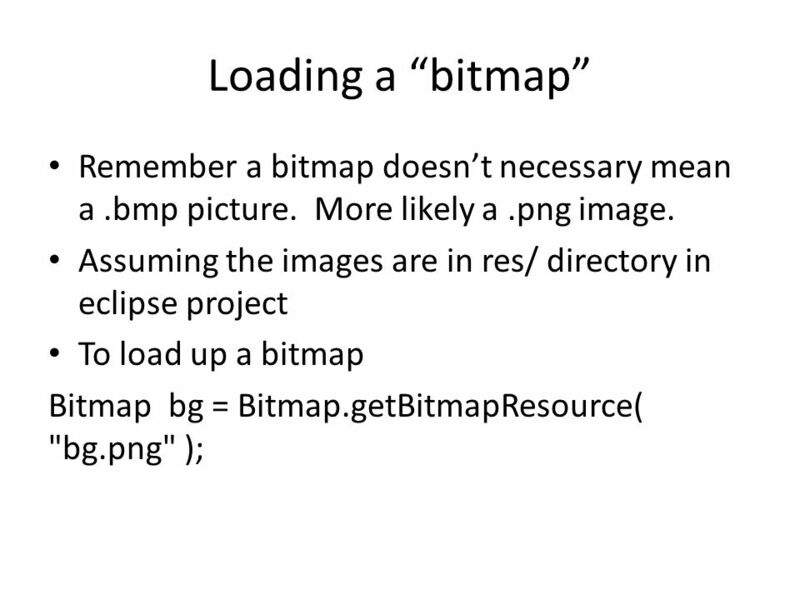 – When the screen is repainted, it draws the off screen bitmap – So double buffering is inherently implemented. This is also true for true for all fields and managers using the UI. 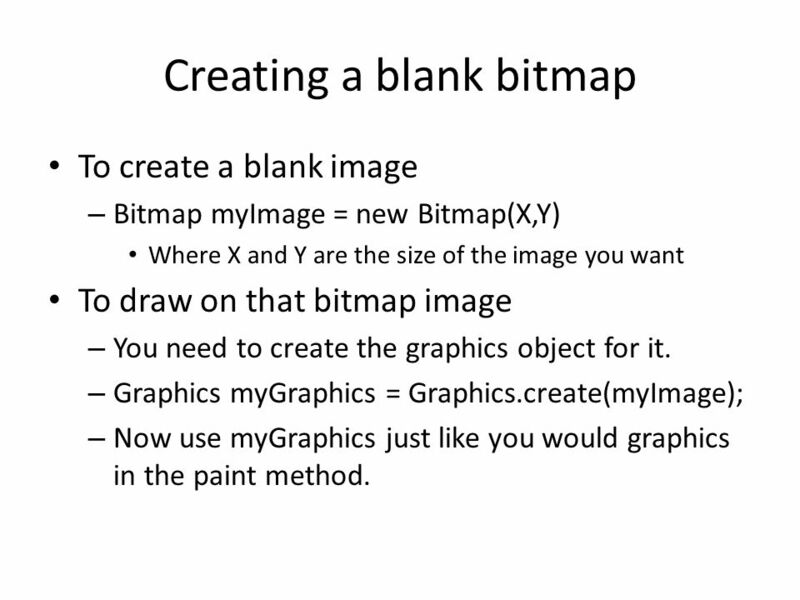 17 Creating a blank bitmap To create a blank image – Bitmap myImage = new Bitmap(X,Y) Where X and Y are the size of the image you want To draw on that bitmap image – You need to create the graphics object for it. – Graphics myGraphics = Graphics.create(myImage); – Now use myGraphics just like you would graphics in the paint method. 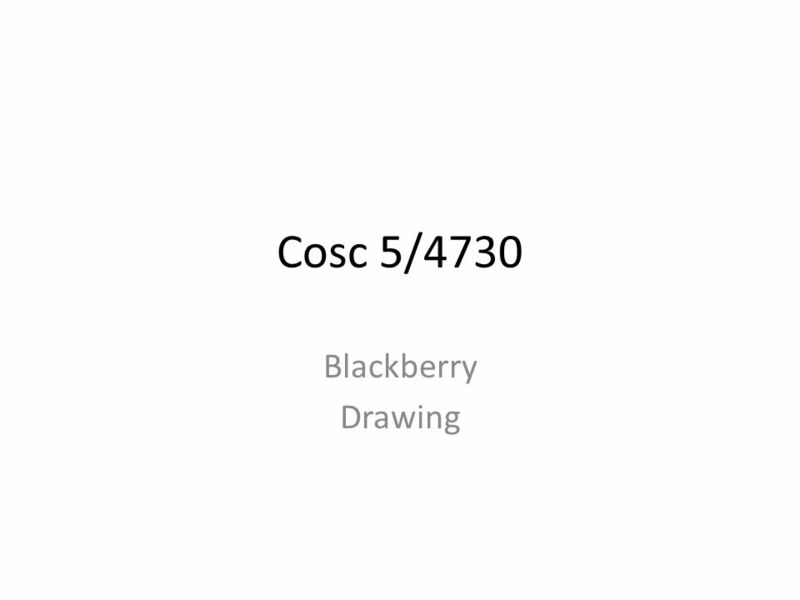 Download ppt "Cosc 5/4730 Blackberry Drawing. Screen size With Blackberry devices, they have a known screen size in pixels. If you are programming for specific device." Chapter 15 Graphics. To paint, you need to specify where to paint. Each component has its own coordinate system with the origin (0, 0) at the upper-left. Copyright 2006 by Pearson Education 1 Building Java Programs Supplement 3G: Graphics. 2D Graphics Drawing Things. Graphics In your GUI, you might want to draw graphics E.g. draw lines, circles, shapes, draw strings etc The Graphics class. 1 More on Applets Overview l Changing Colors l Changing Fonts & Styles l Applet Life-Cycle l Input using Dialog Window l Input using HTML parameters l.
AWT Components. 2 Using AWT Components 4 Component –Canvas –Scrollbar –Button –Checkbox –Label –List –Choice –TextComponent –TextArea –TextField 4 Component. Laboratory Study II October, Java Programming Assignment  Write a program to calculate and output the distance traveled by a car on a tank of. 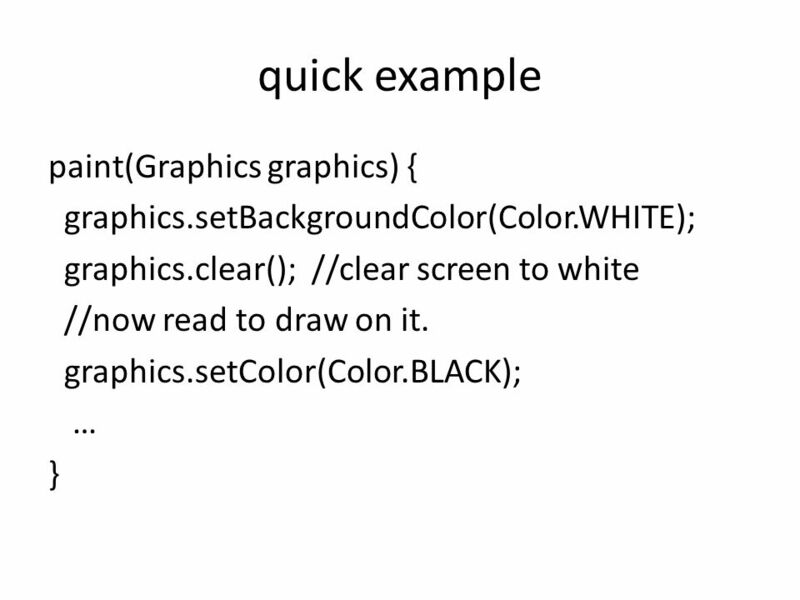 Graphics You draw on a Graphics object The Graphics object cannot directly be created by your code, instead one is generated when the method paintComponent. Graphics Chapter 16.  If you want to draw shapes such as a bar chart, a clock, or a stop sign, how do you do it? Working with images and scenes CS 5010 Program Design Paradigms “Bootcamp” Lesson 2.5 TexPoint fonts used in EMF. Read the TexPoint manual before you delete. Graphics Programming. Introduction GOAL: Build the Indexer Client Event-driven vs. Sequential programs Terminology – Top-level windows are called “frame. 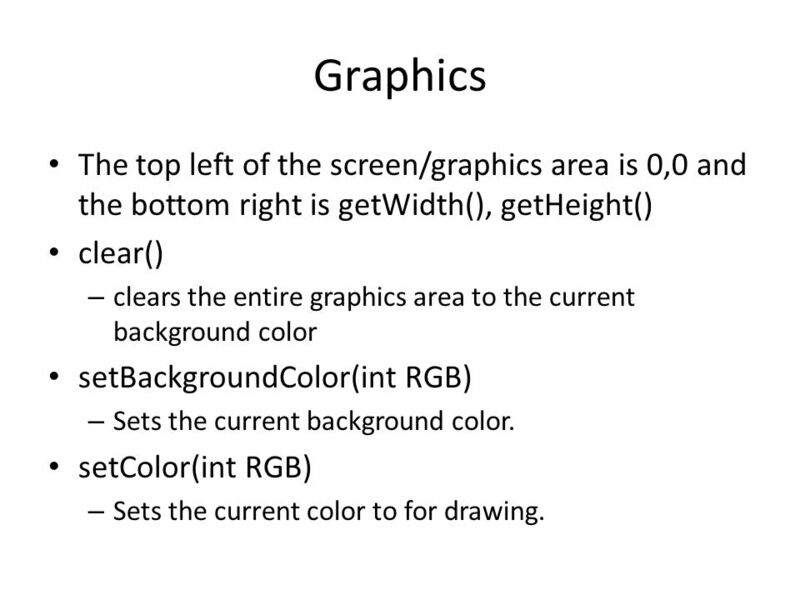 PHY-102 SAPIntroductory GraphicsSlide 1 Introductory Graphics In this section we will learn how about how to draw graphics on the screen in Java:  Drawing. Zhang & Liang, Computer Graphics Using Java 2D and 3D (c) 2007 Pearson Education, Inc. All rights reserved. 1 Chapter 2 2D Graphics: Basics. Graphics CSCI 201L Jeffrey Miller, Ph.D. HTTP :// WWW - SCF. USC. EDU /~ CSCI 201 USC CSCI 201L. 1 Drawing C Sc 335 Object-Oriented Programming and Design Rick Mercer. Georgia Institute of Technology Drawing in Java – part 2 Barb Ericson Georgia Institute of Technology September 2005. Draw Shapes Introduction to simple graphics. What is a graphics context? An instance of the Graphics class Graphics is ABSTRACT! You can extend Graphics.